Exciting, New and Extended Promotions! 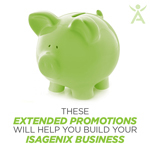 Isagenix is big on offering additional perks for building your business. Earn prizes, product and bonuses on top of your hard earned commissions through the new and extended Isagenix promotions. We are so proud to announce a brand-new promotion—the Million Dollar Challenge. Starting 1 August 2016 through 31 December 2016, you can earn rewards for accomplishing certain business-building activities and for growing your team. This is an opportunity to earn exciting Isagenix merchandise and bonuses for sharing Isagenix with others and welcoming new Members to your team. Earn points and work your way toward earning bonuses, monthly prizes or one of 15 grand prizes! Earn your shares in our 2- to 3 Star, 4- to 6 Star and 7 Star+ Pools if you reach (and maintain) the rank of Paid-As Executive and are increasing your Personal Cycle and Personally Enrolled Team (4PET) growth. As of August, pool share values have increased (2-3 Star businesses earn $18 per share, 4-6 Star businesses earn $20, and 7+ Star businesses earn $30 per share)! Learn more about the Executive Leadership Pool, the 2 Star Executive Leadership Pool and the Platinum Pool. Business builders who reach (and maintain) a Paid-As rank of Director and who are increasing their Personal Cycle Growth may be eligible to earn shares in our Director Leadership Pool. Learn more about the Director Leadership Pool. Earn Double Product Introduction Bonuses when you help two (or more) new Isagenix Members join with qualifying paks during a single commission week. Learn more about AU and NZ Double PIBs. Like Ageless Actives™ with IsaDelights™? You could earn it for FREE by building your Isagenix team. Simply help five new Members join Isagenix with 100 BV or more in one calendar month and you’ll receive a box of Ageless Actives and IsaDelights Dark Chocolate for FREE. You can earn up to TWO boxes per month. And it doesn’t stop there! Learn more about the Team Builders Club. Coach your team to work toward their goals or maintain their results on a qualified pak or system and get paid with the Coaching Bonus. When you help your personally sponsored team members continue to order a qualifying system or pak on Autoship, you get a bonus (equivalent to the PIB for that system or pak) each month their Autoship order is processed! Learn more about the Coaching Bonus. New Associates have the opportunity to earn bonuses by building their Isagenix businesses! Learn more about our Rank Advancement Bonuses. All dollar amounts are shown in USD. Local amounts may be subject to the Isagenix Foreign Exchange Policy.